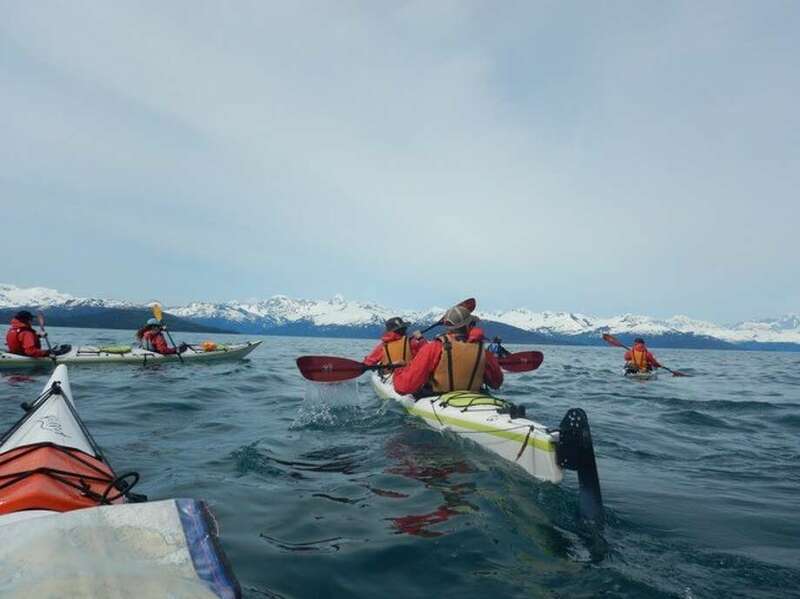 Westport resident Nadia Carrie paddles with classmates in Prince William Sound during the sea-kayaking portion of a 75-day expedition in Alaska this summer. WESTPORT — After nearly two and a half months trekking through the Alaskan wilderness, town resident Nadia Carrie found herself just a quarter of a football field away from a grizzly bear. That moment was exciting for Carrie — and objectively dangerous, she said — but she was well-prepared with background on protocol for that type of a run-in and weeks of new experience under her belt. The 19-year-old recently finished a 75-day expedition in Alaska, kayaking, hiking and mountaineering hundreds of miles over land, sea and snow. Carrie’s expedition was part of a summer semester with the National Outdoor Leadership School, a program that runs wilderness programs for students. Nine other students and three instructors were with Carrie during the expedition. One instructor was along for the full 75 days, while the other two alternated. With a small group for weeks at a time in the wilderness, the group became close, Carrie said. During the trip Carrie did three sections of expeditions. First, her group sea kayaked 181 nautical miles over 22 days in the Prince William Sound. A 24-day, 103-mile hike through the Healy Mountains followed. The final piece of the trip was a 23-day mountaineering portion in Denali National Park, where she racked up another 90 miles under her belt. Carrie said her favorite parts of the semester were during the mountaineering portion, which she described as a unique experience. She learned how to hike on a glacier, travel on foot through glacial snow and camp in those conditions. Other highlights along the trek included meeting a group of local fishermen who gifted the group with salmon. The group camped for most of the 75-day expedition, returning to “civilization” for a day or two to switch their gear and get supplies after each more than three-week section, Carrie said. During the treks, she had to carry food and supplies in a backpack. Along with learning technical skills, including climbing, snowshoeing and camping, Carrie learned a number of leadership skills while in Alaska. For a couple of days in each section, Carrie was in charge, serving as the expedition leader and responsible for making a plan for the day’s route and rallying the 13-person group to make it happen. “Having to learn a whole bunch of new ways of living and new systems, it helps you get organized,” she said. The expedition was not without its challenges. Carrie said her biggest hurdle was the physical difficulty of trekking long distances with a heavy backpack. The trip was also a large mental challenge at times, she added. During the expedition, it rained for five days straight, leaving the group wet and cold constantly, forced to dry their clothes with their own body heat. Carrie said the experience helped her learn to deal with adversity and uncertain situations. One element Carrie found less of a challenge was the prospect of being in the wilderness for such a long period of time, which she said many students struggle with. “I just took it one day at a time,” she said. Carrie, a 2015 Staples High School graduate, learned about the NOLS program at a gap year programs fair. Now nearing its end, she also spent parts of her gap year working on a cruise ship and taking care of her grandparents in Hawaii. Carrie will head to college in Portland, Ore. this fall.